Only this faded marquee remains from The Other Cafe at Cole and Carl Streets. 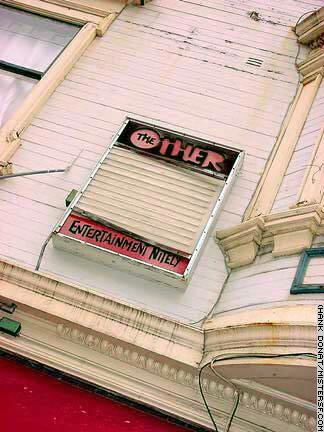 During the comedy boom of the 1980s and '90s, "The Other" and the Holy City Zoo on Clement were the City's most coveted venues for stand up comics. The City had seen an earlier comedy explosion with Lenny Bruce and the North Beach scene in the '60s. In the early '90s, San Francisco comics were in great demand and honed their talents here in hopes of following Jerry Seinfeld and Roseanne into television. Maria Falzone was a finalist in the 17th Annual San Francisco Comedy Competition in 1992 and is a veteran of The Other. She shares her memories, "I stood up to the booker at The Other. He had a problem with me talking about my family and using the Italian accent. He felt I sounded too much like Father Guido Sarducci. I stood up for myself and said that I was willing not to play the club because that's how my family talked! I was also a contestant on the Dating Game there and every time the bachelor asked me a question I had a funny answer that usually involved his mother. I found out later that Robin Williams was watching from the green room and was laughing at me. I remember Dennis Miller showing up on a Monday night and doing a set and being blown away by how brilliant and funny he was. You never knew who was going to show up so you had to be there." Dana Carvey, Paula Poundstone, and Bobcat Goldthwaite were also frequent performers. The Other Cafe closed after launching a location in Emmeryville just in time for a glut of stand up comics that came along with a whole host of free comedy on cable television. Both the Emmeryville and San Francisco locations closed in the mid-90's. The Holy City Zoo also shut down after comedian Will Durst bought that club but was not able to revive the scene.